The weather here in Germany has been absolutely amazing this past few weeks. Warm and dry, just the perfect summer weather. I love summer and I love to see the change in people once it gets hot outside. The change in behaviour and mood is just amazing. People seem to be more relaxed and generally more happy. For me personally it is so much easier to get out of bed in the morning. I basically jump right out of it, ready for new adventures. My husband and I also tend to stop working earlier, pack our stuff and go swimming in the nearby lakes. I love swimming in the lakes, it'so refreshing after a hot and busy day. Summer is when I life happens outside, when you get to do and see so much. For me it's the most beautiful time of the year. So if you like summer I can highly recommend these two things: get up early, get everything done and hit a nearby lake or the ocean if you can and make the most of these endless summer days as the aren't so endless after all. 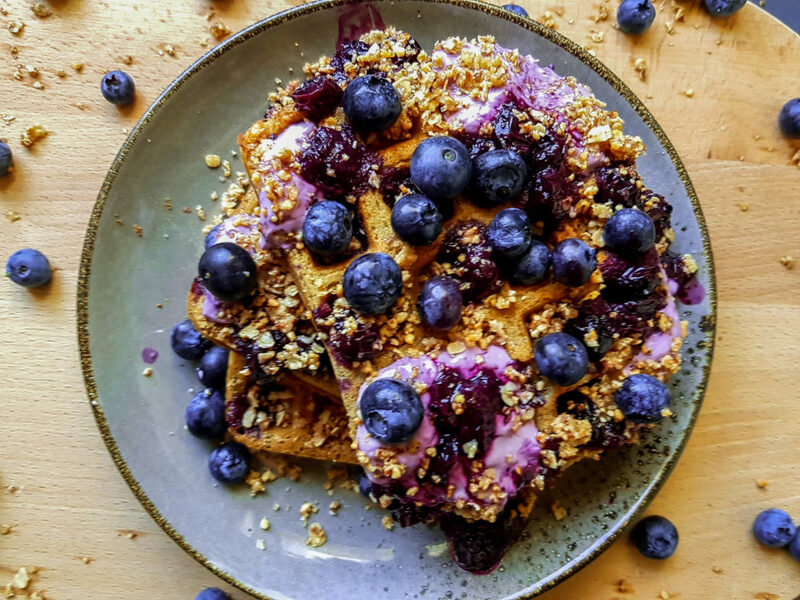 Another two things I have been loving this summer are blueberries and breakfast. This is kind of new to me. While the whole world always seemed to love blueberries I was more into raspberries, strawberries and blackberries. Lately however I came to realize how great blueberries are. They are yummy,you never have to chop them and it's so fun to play with that deep blue or purple colour. 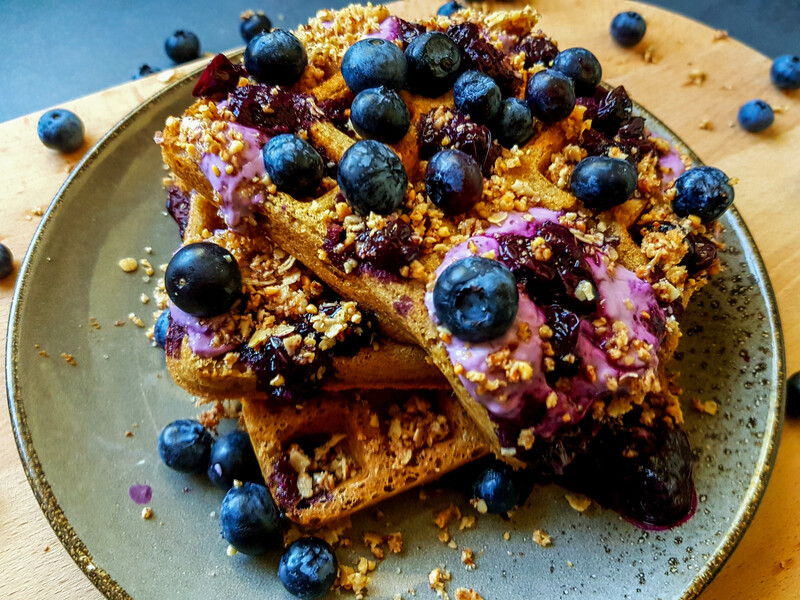 And guess what as I love blueberries and breakfast so much and I need a good breakfast in the morning as I've been spending my days biking and swimming and yogaing, I made a lot of blueberry breakfast stuff, like pancakes and frech toasts and bars and waffles. Wait waffles? Yes, waffles! They are new to my blog, but they fit right in and I love them. They are perfect for breakfast or dessert and super easy to whip up. Enjoy! 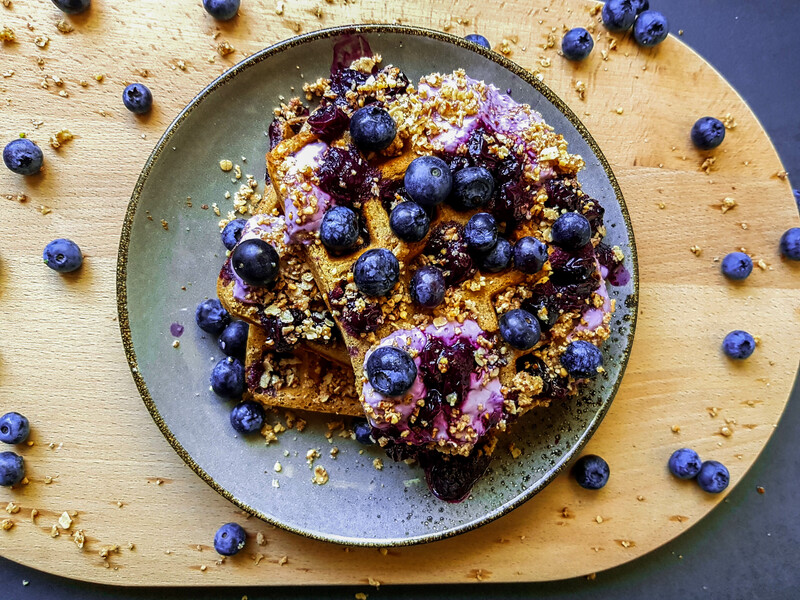 In a blender, blend the blueberries with the maple syrup and water until it forms a syrup. Pour into a small saucepan and bring to simmer. Let it simmer until it becomes thick. This may take 10-20 minutes. Proceed with waffle making in the meantime. In a small bowl, add the vegan cream cheese and about 2 tablespoons blueberry syrup. Whisk until it forms a creamy spread. Heat the waffle iron; grease if necessary. In a medium sized bowl, whisk together flour, sugar, baking powder, and salt. Then add milk, oil, and vanilla and whisk until well combined. When ready, pour batter into the waffle iron and cook waffles according to the instructions of your waffle iron. Continue until you used up all the batter. For me this makes 4-5 waffles, which is good for dessert. For breakfast I would double the amount of batter. 1.Mix all the ingredients until well combined. I used my hands. Store crumble in the fridge until ready to use. 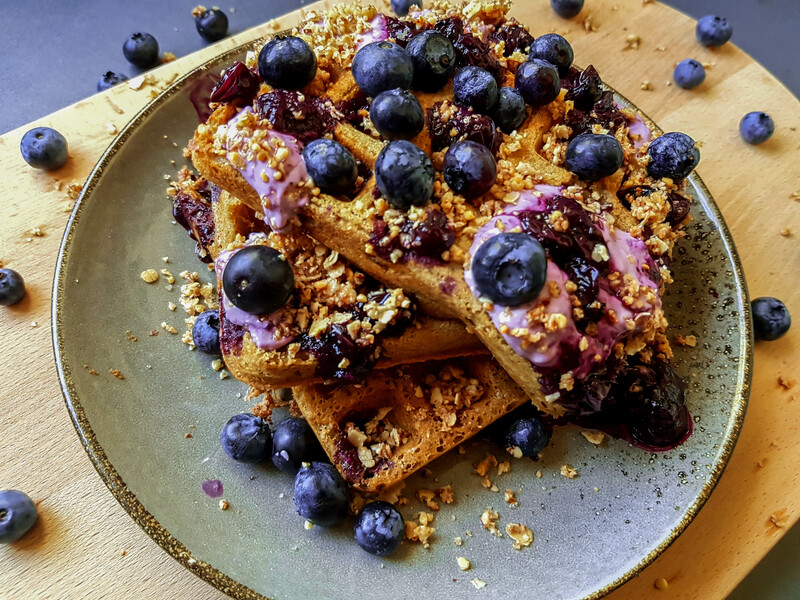 In a blender, blend the blueberries with the maple syrup and water until it forms a syrup. Pour into a small saucepan and bring to simmer. Let it simmer until it becomes thick. Place waffles on a plate and top with as much toppings as you like. I also added fresh blueberries, but can totally go for less than four toppings. f you tried this, please let me now how you liked it in the comment section down below and if you want to get notified about more recipes like this, a subscription is just three clicks away.